Great demand on stock on Thursday. Gerard Haughey £995/420kg, £995/530kg, Pearse and Matthew Rafferty £960/400kg, £950/410kg, £925/410kg, Peter and Stephen McNally £920/410kg, Patrick McKernan £925/420kg, Patrick Donnolly £920/460kg, £870/420kg, £870/460kg, Gerard Haughey £900/420kg, £900/420kg, D Mullan £875/410kg, Stephen Cuddy £870/490kg, £855/470kg, Patrick McKernan £835/420kg, £830/380kg, Patrick McCallan £835/350kg, Owen O’Neill £800/430kg, Peter and Stephen McNally £785/340kg, £750/400kg, Alan Ferguson £765/350kg and Patrick McCallan £750/360kg, £700/310kg. 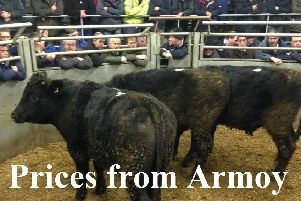 Liam Nugent £965/450kg, Jerome Gormley £940/380kg, Pearse Matthew Rafferty £880/400kg, Patrick McKernan £860/390kg, Joe McQuaid £840/440kg, £830/500kg, Kevin McAleer £830/420kg, Pearse and Matthew Rafferty £820/400kg, Rodger Gormley £800/380kg, £800/360kg, Patrick McKernan £795/400kg, Christopher Meenagh £785/340kg, Patrick Donnolly £775/390kg, Roger Gormley £760/390kg, Aidan O’Neill £745/400kg, £735/400kg, Danielle Gormley £730/360kg, J Hetherington £720/400kg, £715/400kg, £700/390kg, D Hutchinson £710/360kg and Aidan O’Neill £705/380kg, £700/380kg, £700/370kg.